Enjoy a short stroll to the Old Edwards Inn and Spa or the Ugly Dog on 4th Street Highlands NC, this home is located just a few blocks from the corner of 4th and Main Street. Perfect location for easy access to all the Fine Dining and Boutique Shopping that Main Street Highlands has to offer. 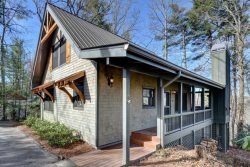 Enjoy this contemporary updated vacation rental cottage in Highlands NC, located on Historic Satulah Mountain a block off of S.4th Street, Highlands NC. This Old Farm Road vacation rental cottage has been tastefully renovated and offers beautiful custom finishes. The ranch style floor plan is both cozy and comfortable. Perfect for one or two couples with wood floors, gas fireplace, two bedrooms with king and queen and two baths with walk in showers. Access to public golf is also available just phone us for more details in planning your vacation here in Highlands, NC. We loved the little house! It was bright and pretty inside and close to town. We do allot of walking and loved the location. My contact was Alicen. Alicen was friendly, professional, and eager to help. The convenience of this property to town center was more than we had hoped for. Also, the property had been updated which made it appealing. We had a power outage and Alicen was very responsive. We loved this cozy little house! We loved being so close to Main Street.